Making healthy food is pretty easy once you have the basics down. Making healthy food that excites and delights the kiddos is an art. Developing palettes are often sensitive to the bitter flavors in a lot of healthy vegetables, and often, what tastes delicious to an adult tastes absolutely disgusting to a child. 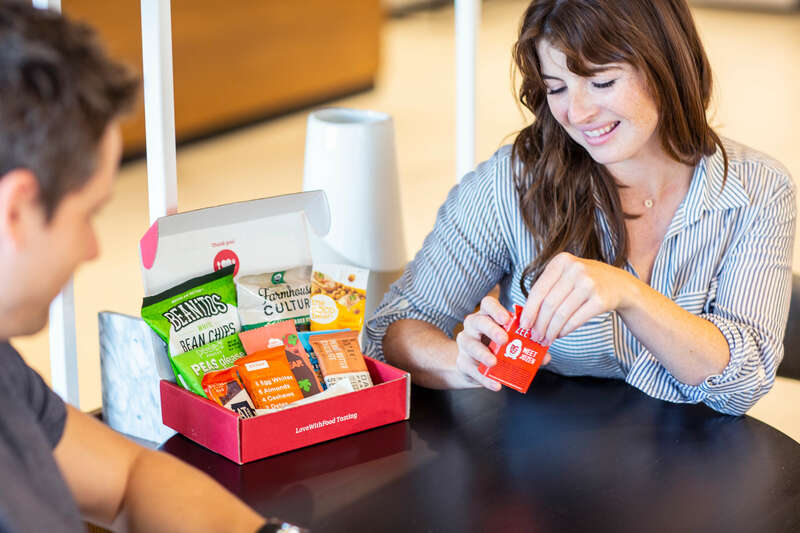 To bring you a list of healthy snacks kids will love, we scoured the internet and even took some tips from the best-of-the-best experts in kids snacking: moms. We hope these fun and easy-to-make snacks for kids lead to lots of happy tummies and smiling faces. 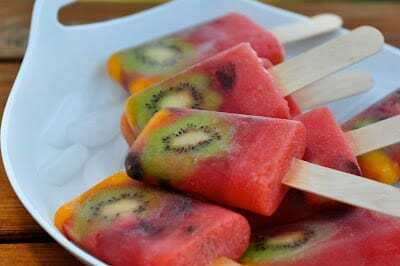 Popsicles don’t have to be packed with sugar to taste sweet and delicious, and Nourishing Meals has a simple recipe to prove it. These treats are made from pure and good watermelon, blueberries, strawberries, kiwi, peaches, and cherries. Feel-good fact: Free from harmful dyes, these clean pops won’t turn little mouths red. Prepare veggies in interesting ways to pique kids’ interest. These walnut-meat zucchini rolls from Veggies Don’t Bite are fun for little ones to eat for an afternoon snack, especially if they’re always curious about mommy’s sushi. Feel-good fact: Packed with multiple vegetables, these snacks provide a wonderful opportunity to introduce kids to the world of edible plants. 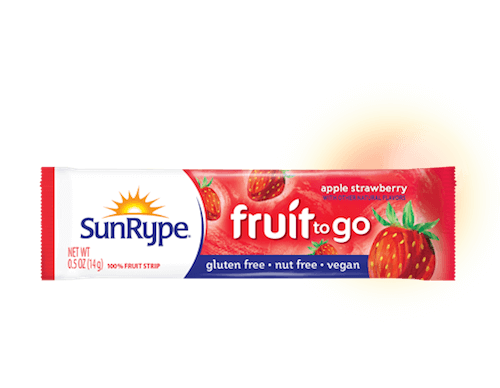 If you’re traveling or just in a hurry, you can still give the kiddos some healthy whole-fruit goodness with SunRype’s Fruit to Go bars. Each bar is packed with real fruit purees and flavor that beats any processed fruit snack. Plus, these snacks do not have peanuts or tree nuts, so they’re perfect for families with allergy concerns. Feel-good fact: The bars have no added sugar. Feel-good fact: The good fat in avocados will keep little tummies full and happy for hours. Pack heart-healthy nuts and seeds into a fiber-filled snack kids will love. 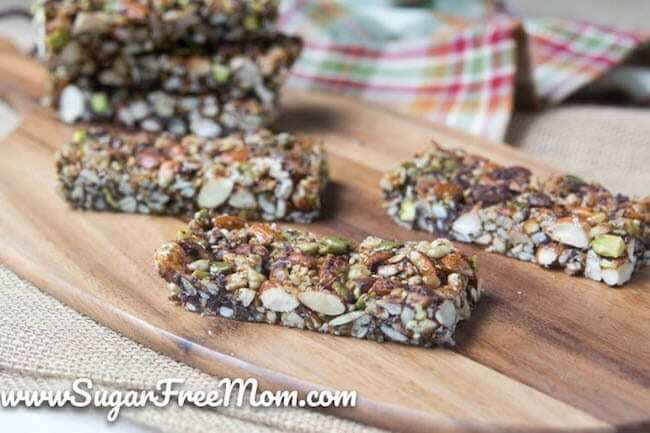 These bars from Sugar-Free Mom taste as good as any processed granola bar, and any processed candy bar for that matter. Feel-good fact: These bars have no added sugar—just wholesome ingredients for steady, sustained energy. 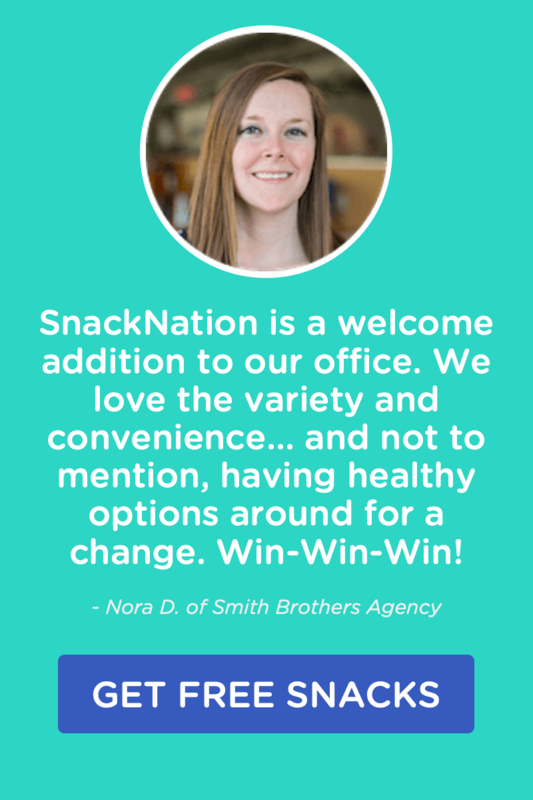 Somersaults makes healthy nut-free snacks for kids. They’re perfect if your little one has an allergy or if you’re just being cautious. 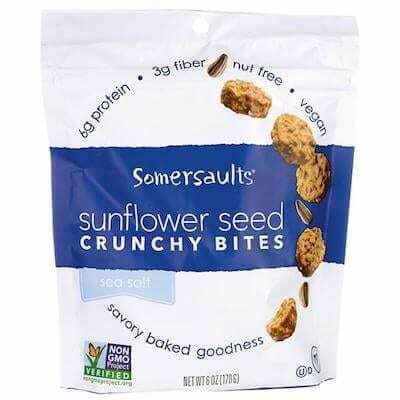 These lightly salted bite-sized snacks are made from sunflower seeds, sesame seeds, and whole- wheat flour. Plus, the wholesome bites are the perfect size for little hands and little mouths. 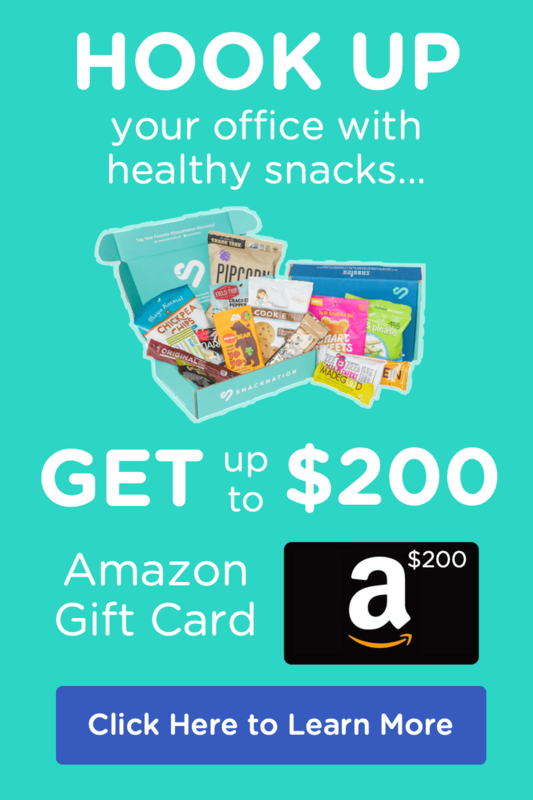 Feel-good fact: These snacks have 8% of the recommended daily value of vitamin E.
Super parents, prepare for your next challenge: making your own healthy fruit snacks. These fruity rolls from Healthy Little Cooks require only bananas, orange juice, and cinnamon. What are you waiting for? There’s a lot of healthy, fruity snacking in your kids’ future. Feel-good fact: These homemade fruit rolls keep kids from eating unhealthy fruit chews with lots of preservatives and additives. Can’t get your kids to try your garlicky hummus flecked with pine nuts? Try this sweetened up, kid-approved hummus recipe from Super Healthy Kids instead. To make a chocolatey version of standard hummus, cocoa powder replaces garlic, and nut butter replaces tahini paste. The result is a healthy hummus you don’t have to coax your kids into eating. It tastes amazing on any kind of fruit you can think of. Feel-good fact: Packed with chickpeas and nut butter, this snack provides plenty of substance along with the sweet. This helps avoid sugar rushes. The smell may be incredibly tempting, but we urge you to skip the pretzel stand and head home to make your own twisty treats. 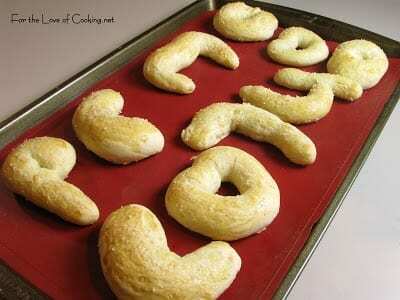 Once you see how easy it is to make your own healthy pretzels, you’ll never want to eat those butter-flavored fakes again. Get a go-to recipe from For the Love of Cooking. Feel-good fact: These pretzels are made of pure and simple ingredients—no partially hydrogenated oils or weird additives. You can’t stop the kids from craving pizza, but you can deliver a pizza with a serious nutritional punch. Rub some olive oil on a whole-wheat pita pocket. Cover the pita with chopped baby spinach. Then top everything with a mix of shredded mozzarella and swiss cheese, plus a pinch of garlic salt. Microwave the pita for about a minute or until the cheese is bubbly. Feel-good fact: This pizza will set kids up to love—even crave—green things. If you think you’ll never get your kids to eat kale, then you haven’t tried this awesome recipe from Teach Eat Love, which features kale in a nuggety, kid-friendly form. Feel-good fact: Kale is filled with vitamin K, a nutrient which helps young bodies build bones. Plain granola is boring. Granola bark is exciting! Just add an egg and almond flour to a classic granola mix, bake it in a pan, and break up the pieces. Learn how to make Granola Bark from Every Day Annie. Feel-good fact: The oat base of this granola bark delivers the dream team of fiber and protein, providing a healthy dose of clean energy. 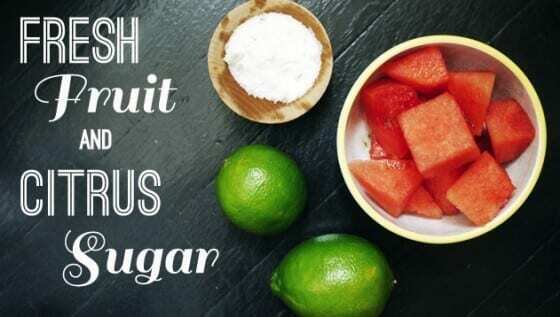 Do what One Hungry Mama does and turn fresh fruit into nutrient-dense “candy” with the addition of citrus sugar, which you can make from citrus zest and sugar. While citrus sugar is still sugar, it might just get the kids eating way more fresh fruit. Feel-good fact: This snack can be ready in seconds—faster than your little one can build a chair tower leading to the candy shelf. You can feel good about giving kids a special treat when it’s made of clean ingredients. Abby’s Chocolate Chip cookies will make you and your little one smile. Made with filling and nutritious whole wheat flour, the nut-free cookies are safe for those with allergies to peanuts and tree nuts. 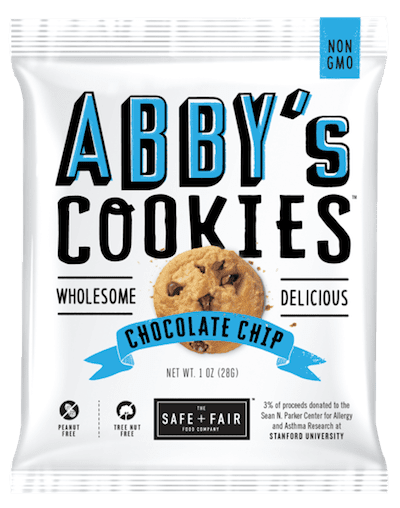 Feel-good fact: Abby’s cookies are made with non-GMO (genetically modified organism) ingredients. Follow the lead of Family Fresh Meals and pop some eggs into muffin tins and bake to make a clean and easy kids’ snack. Eggs have a mild flavor kids love, and you can add their favorite toppings halfway through baking to make the treat extra special. Feel-good fact: Eggs are packed with choline that supports healthy cell functioning. Here’s another lovable snack that goes above and beyond on the presentation. 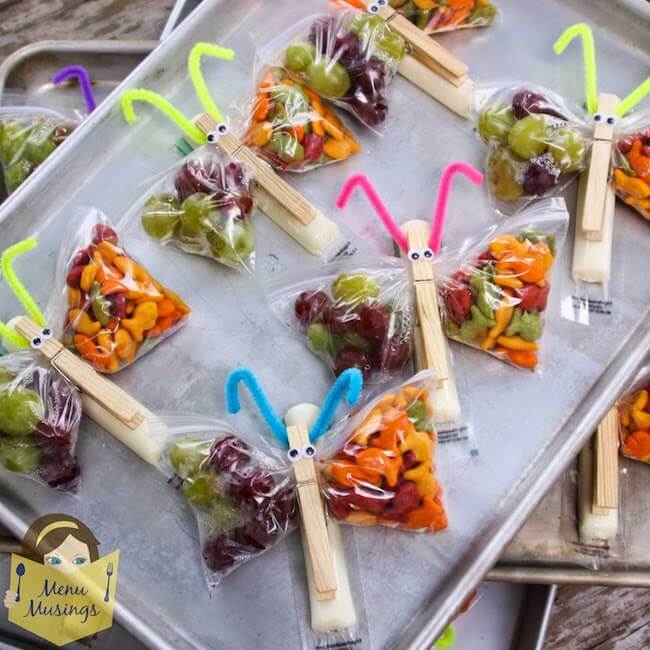 Pack healthy snacks into a plastic baggy and clip it in half with an embellished clothespin to make butterfly snacks your kids will love. Get the instructions from Menu Musings of a Modern American Mom. Feel-good fact: With a presentation this cute, you can get kids to eat pretty much any healthy snack you want. Feel-good fact: These little buttons look like candy, but they’re made of yogurt and nothing else, so they’re super wholesome. Making these cucumber caterpillars from Super Healthy Kids couldn’t possibly be easier. You just slice up a bunch of veggies, arrange them on a plate, and set out some low-fat ranch dressing. Feel-good fact: Healthy, mildly flavored cucumbers make the perfect veggie introduction for kids. 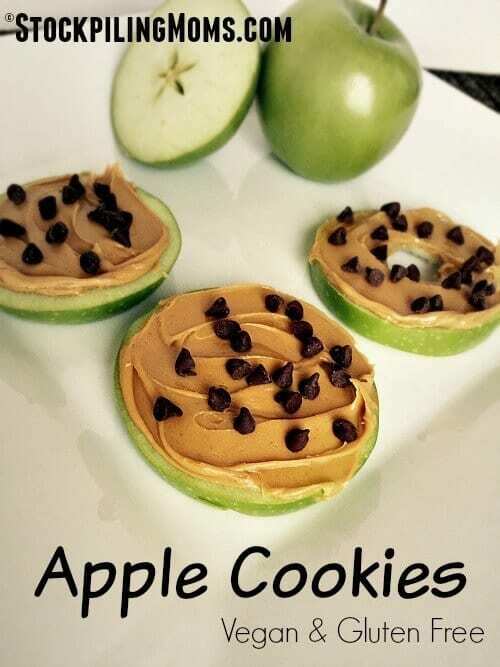 Capture the delicious magic of a cookie using an apple slice, no-sugar peanut butter, and chocolate chips. You can make the Stockpiling Moms fruit-based “cookies” faster than a peanut butter and jelly sandwich, getting a healthy snack into your kids’ hands in seconds. Feel-good fact: This snack has little added sugar, and it satisfies kids’ cravings for cookies in a snap of crisp, refreshing apple. Make wholesome crackers you kids will request again and again. This cracker dough from the Yummy Mummy Club is fast and easy to make, leaving you with plenty of time to cut out any shapes your kids want. Feel-good fact: The sweet potato in these crackers adds a healthy dose of vitamin A and carotenoids to snack time. Introduce kids to a variety of vegetables early, and they’ll be more open to trying lots of new foods as they grow up. A tasty blend of carrot and potato, the parsnip is the perfect kid-friendly vegetable to try, especially in the form of these savory rosemary fries from the Kitchen Prep. 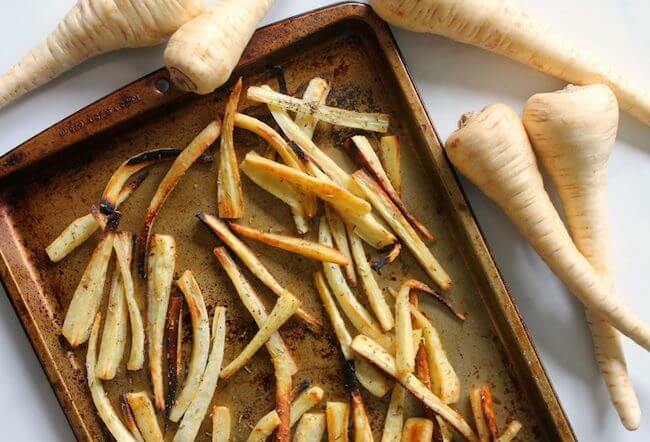 Feel-good fact: Fiber-filled parsnips will fill kids up fast, so they’re less likely to overdose on starchy fries. Pass on the microwavable macaroni and cheese and try this healthier, from-scratch cheesy cauliflower recipe from Add a Pinch. Microwave Greek yogurt, cauliflower, and cheese to magically transform the ingredients into a comforting bowl of goodness kids will love. Feel-good fact: Cauliflower tastes nothing like a citrus fruit, but it’s packed full of immune-boosting vitamin C.
Turn up the nutrition content of a cinnamon roll to make a healthy snack your kids will crave and you won’t feel guilty about serving them. 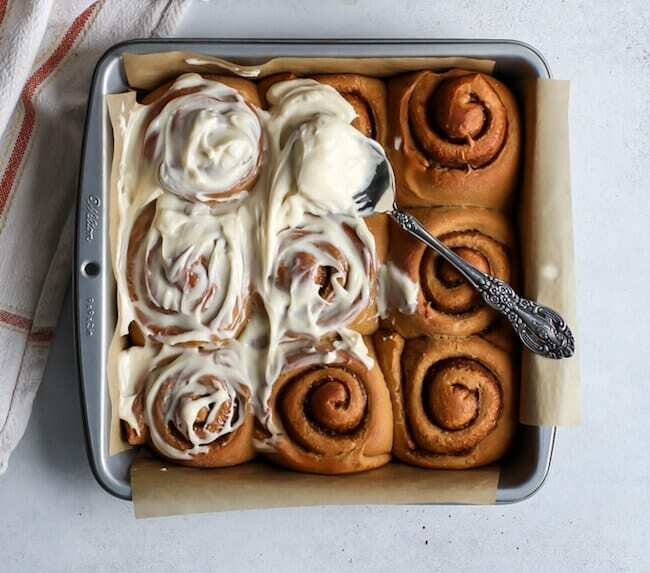 Made with whole-food ingredients, these cinnamon rolls from Fit Mitten Kitchen fill kids up so they won’t be tempted to gobble down an entire tray of sugar-dense treats. Feel-good fact: There’s nothing funny in these cinnamon buns—no preservatives, fatty oils, or corn syrups. 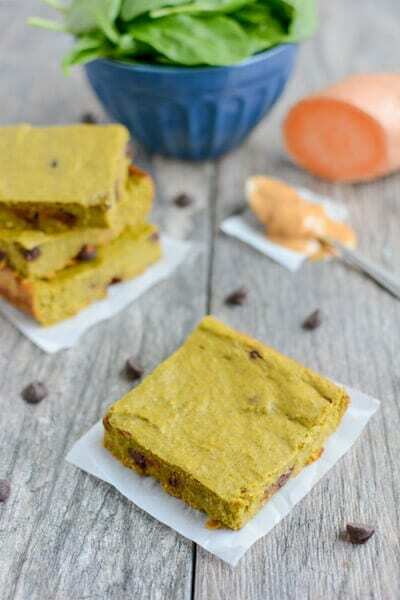 Kids might not be willing to eat a green smoothie, but they’ll probably eat these green smoothie bars because they have a sweet, cookie-like texture. These Lean Green Bean bars have a powerhouse mix of spinach, sweet potato, yogurt, and other wholesome ingredient that come together to make a sweet bar the kids will gobble up (and that’s a good thing). Feel-good fact: This sweet treat is the perfect way to work some spinach into kids’ diets. Punch up the classic, kid-favorite crispy rice treat with freeze-dried strawberries. In addition to incorporating a little more fruit into your kids’ diets, these sweet bites don’t need to be baked, so you can have a plate of them ready in just a few minutes. Recipe from Cottor Crunch can be found here. Feel-good fact: These sweet treats pack a little extra vitamin C into a snacking slot that could easily be filled with empty calories. Spread canned pureed sweet potatoes onto a whole-wheat tortilla. Cover the potatoes with baby kale and a handful of mozzarella cheese, and then place another tortilla on top. Microwave for one minute to make a mild kid-friendly quesadilla with a hint of sweetness. 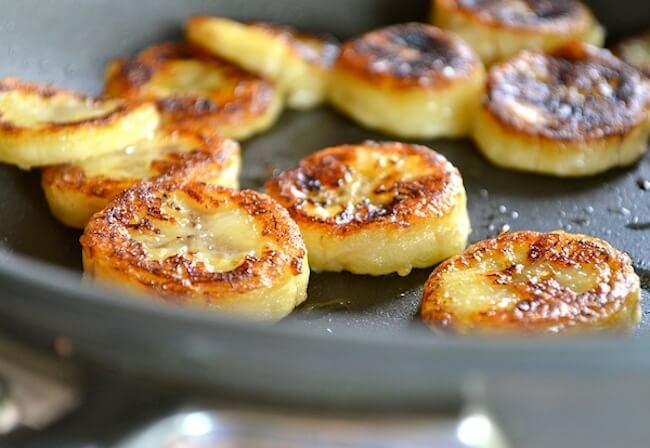 Feel-good fact: Wholesome sweet potatoes are packed with vitamin A.
Bananas are great by themselves, but transform them into a super-special treat by cooking them in a skillet with some honey. 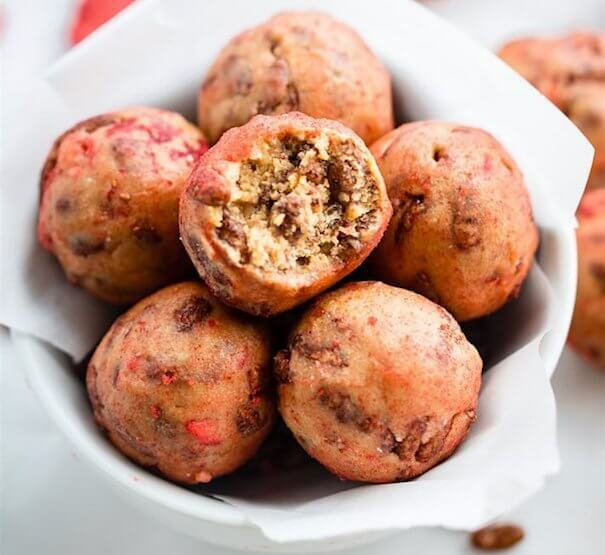 Who knew bananas could taste even better? Your kids will gobble these snacks up, and you’ll be happy to let them do it. Get the recipe from Rachel Schulz. Feel-good fact: Honey-sweetened bananas make the perfect stand-in for less healthy candy. The Gracious Wife rolls bananas in wholesome crispy rice cereal and peanut butter to make perfectly simple snacks with kid-pleasing flavor, protein, and healthy nutrients. Just keep the three ingredients on hand so you can be ready to whip up some healthy snacks on a moment’s notice. Feel-good fact: Bananas are packed with vitamin B6 that aids in brain functioning. 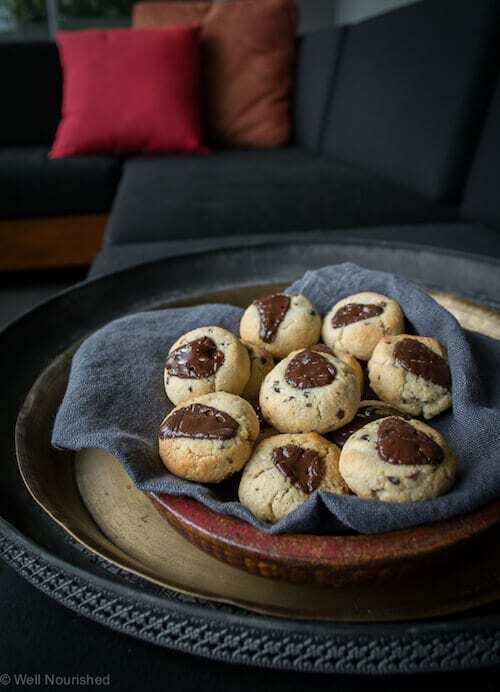 These cookies call for hearty almond meal instead of flour, coconut oil instead of butter, dark chocolate chips or cocoa nibs instead of semi-sweet morsels, and raw honey instead of sugar. Filled with so many good ingredients, a classic chocolate-chip cookie turns into a nutrient-rich sweet snack that’s perfect for kids…and maybe even adults. Feel-good fact: Filled with so many good things, this cookie is more than dessert; it’s a perfect anytime snack. 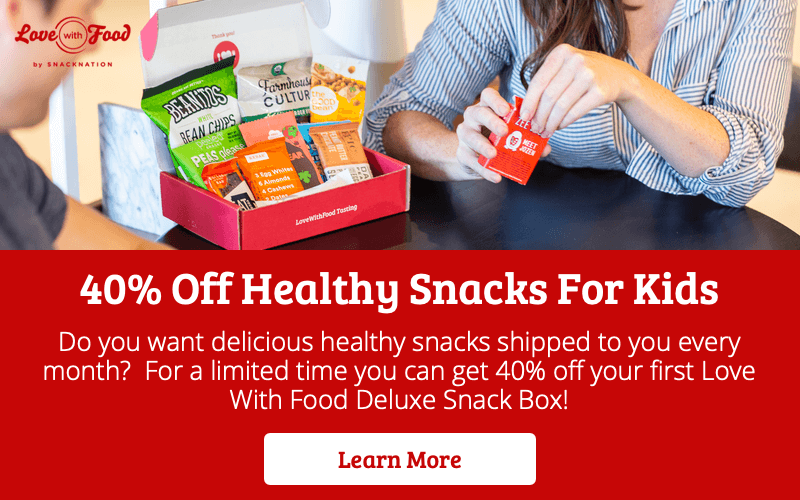 What’s your favorite healthy snacks for kids? Let us know in the comment section below!